It’s frustrating to open multiple links , especially when you are trying to search information for a paperwork (and you most likely open several tens of tabs) . So i will give you a really easy solution for two major browsers : Google Chrome and Mozilla Firefox . 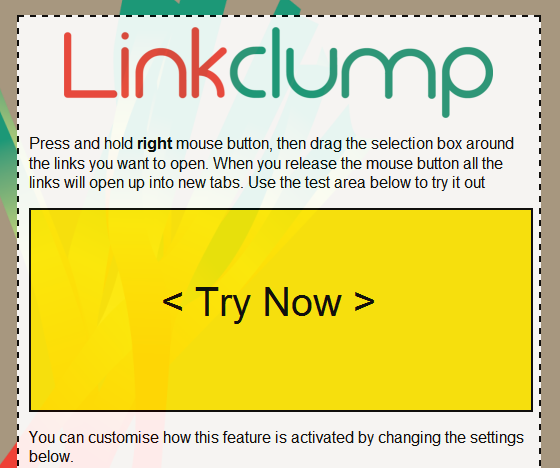 All you have to do is to go to your chrome store(access it from your google engine) and download the Linkclump extension. Here you have a link in case you don’t have enough time for searching . Add it to Chrome and you’ll be ready to use it . You’ll just have to select by pressing your right mouse button(this is the default shortcut key -> of course you can change it). – Action: choose to open links as new tabs, into a new window, copy to clipboard or saved to your bookmarks. You can setup multiple actions. – Activation: choose how to activated the selection box using different mouse and key combinations (including shift/alt/ctrl). Posted in	How-to. Tagged with	link open, multiple links.